I’m doing this as a favor to Michael as he enjoyed some of my comments to his original story Dreaming About Your Cat. I’ve been enlightened by the comments by some of the regular readers here. I now find I’m not alone in dreaming about cats I’ve had in the past who now reside on the Rainbow Bridge. I do seem to be the only one to comment on dreaming about cats I’ve never met. Dreaming About Cats. Background image by VinothChandar. 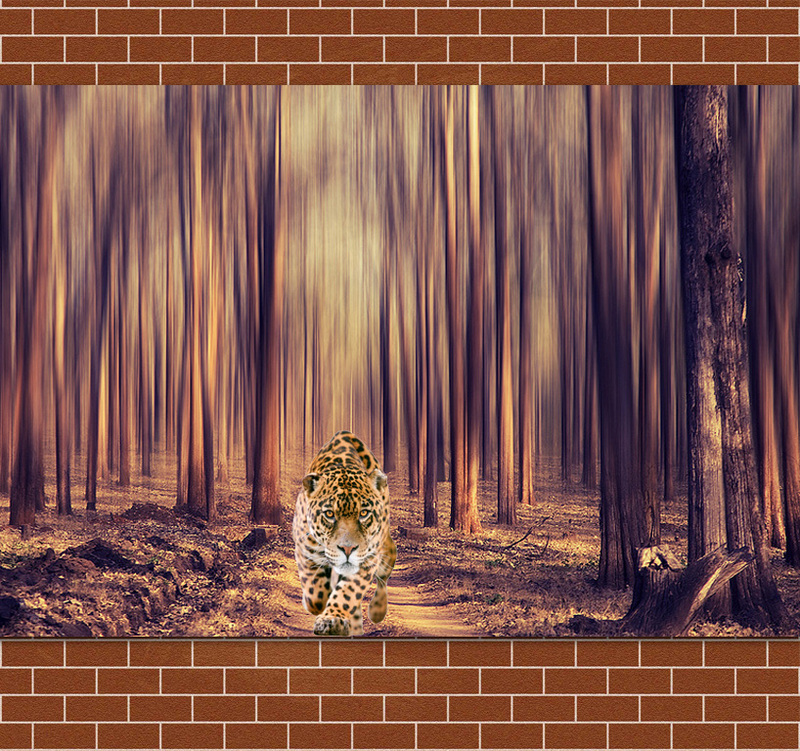 Leopard picture is bought. Collage by Michael. I’ll be the first to admit those are some very strange dreams. Ruth had asked me whether the dreams are the type to leave me paralyzed as I have them. I know what she’s referring to, but that’s not the case with the strange cat dreams. I don’t have the dreams very often. I’m always very deep in sleep when they occur. For the record, I’ve been diagnosed with acute as well as chronic insomnia. This means I not only have a lot of trouble getting to sleep, I have trouble staying asleep. In the dreams I’m most always outside in a country setting. The dreams are very lucid and the cat I’m dreaming of will communicate telepathically. And I do dream in color, at least while having the cat dreams. My emotions also run high in these dreams. I always feel so much love for the cat. I also recognize while I’m dreaming that this IS a dream, and that the cat will no longer exist when I wake up. It makes me sad and I try to stay asleep as long as possible to spend every moment I can with the dream cat. My dreams have been so vivid over the years, they make me afraid of sleep. I really don’t expect any improvement as I get older. My doctor has tried me on every new sleeping pill to come out and none of them kept me asleep for more than three hours before waking. I do admit the Ambien was interesting. I’d stay up and cook crock pot meals and not remember cooking. I did have some delicious new dishes to try that I made while under the influence. I’m currently not on any medication to help me sleep. I take an Elavil each night to prevent migraines, but nothing else. I lay awake for hours most nights. Michael can back me up that I’m almost always awake. He’ll email me at 5 a.m. my time, and I return his email immediately. Experts studying the subject claim we have memories of events experienced by our ancestors because genetic memories are built into our DNA. I’ve had a lot of strange experiences over the years with knowing things I shouldn’t know. This led me to do some research into genetic memories. I’m a firm believer in genetic memories to the point I’ve written several papers on the subject. Genetic memories explain what a lot of people call déjà vu. It’s also one possible explanation for talents a person is born with. More that thirty years ago I was able to locate our ancestral home by canvassing the town they settled in. I located a large house that appeared a bit too familiar to shake off the feeling of familiarity. I traced the house back through land deeds and learned my great-great grandparents once owned the house. The only conclusion I’ve come from dreaming about cats I’ve never met is genetic memories. It’s quite possible I’m dreaming of a cat once loved by my great great grandmother. Or a distant aunt who’s been dead for a hundred years. I welcome the cat dreams, even if they make me a little sad knowing I’ll only have a few hours in which to love my dream cat. I can’t wait to see the comments on this one. This entry was posted in Human to cat relationship and tagged dreams about cats, human to cat relationship by Michael Broad. Bookmark the permalink. If I’m awake at 3:30 someone small and furry had something to do with it. I realized today that I dream of streams and rivers a lot. I was cross country skiing today and found many streams running through the woods from melting snow and it made me realize that. When Jeff and I go canoeing sometimes I have a string feeling of déjà vu if we are going through a narrow area where the water is very dark and still. Today have me that feeling also. I told an old friend I was going to go skiing and he asked if I had Monty with me! He reads about Monty and I playing together outside and just assumed if I had driven north to do some skiing, Monty must be coming along to follow me up the trails like he does when I ski around my back yard. Only in my dreams is Monty the kind of cat who enjoys going other places with me. He enjoys exploring his own territory only. I think Monty has bad dreams sometimes because of how he reacts in his sleep– meowing that’s like a whimpering and he twitches. I wonder what he dreams of. Wow Ruth it really sounds like you have a wonderful life. I wish there were more rivers and streams and canoeing in my life. Marc, don’t you live in Switzerland? I’m sure there are spectacularly beautiful places there that rival anything Wisconsin has to offer. You just have to take the time. I work PRN so I often have days I don’t work, leaving time to get out and have fun. Some of my family can’t figure out why I don’t just work full time at one job and make more money. They think I’m lazy and unproductive. They are probably right. But when I do work, I work very hard and when I have time off I make sure to make it memorable. Last night I dreamed of all the partially frozen streams I skied by yesterday. There was a woman in the dream in flowing robes with long hair and she was the spirit of the water and the ice flowing through the woods. It was a cool dream. Read The Covenant Within by R.A.R. Clouston. Its fiction based on genetic memory. Cloustin sent me an email after learning of my genetic memory research. I write about geneaology for Examiner.com. Also write about dogs in Greenville and am at #1 for Greenville Examiners, #4 for dog Examiners and #14 for pet Examiners. My specialty is dogs shot by police. I dream of Dreyfuss, but other than that I dream of cats. Or I dream of my ex who passed away. My mother must have experienced similar events because I found a few articles she clipped back in the 80’s. I can confirm that Elisa is up at all hours. On occasion she asks me why I am still up 😉 – working on the site what else…. The time difference between the UK and USA makes no difference to Elisa. I hope you like the picture I added. I like it! Although I don’t think you dream about leopards. I had hardly heard of genetic memory until your article. It is an interesting subject. I am not sure I believe in but it seems to have some foundation in science. I have very few vivid dreams – about one every ten years. And only on a few occasions have I recognised the fact that I am in a dream. That is an interesting experience because you can do things you wouldn’t be allowed to do in the real world. I don’t dream about cats and I wish I did. Although I have a poor recollection of my dreams so perhaps I do have cat dreams sometimes. LOVED the picture. My dreams have taken an interest turn the past few weeks. I dream I’m writing my cat and dog articles. If I can get awake fast enough I have enough retention to write the dream article word for word. Michael don’t you think it’s a bit strange that after 3 years I’m still coming up with ideas? I may yo-yo between writers block and binge writing, but the stories do tend to land in my lap. And I can feel I’ve only written a small percentage of what I’m capable of. You’re a cat really. Or a cat/dog. I am pleased you like the picture. It would be fun to see what you write based on what you dreamt up in a dream. Phew, that’s dreamy. Some experts recommend that when you are drifting off to sleep you should think of who or what you want to dream about, picture them in your mind and they are in your subconscious for the night. It doesn’t work for me, my dreams just come as they choose. Yes Elisa I do dream of strange cats sometimes, I’m usually somewhere I’ve never been before in my life. I also often visit a place where there are always lots of kittens and they are so real I feel I’m still holding them when I wake up and have a shock to find it was a dream. I didn’t know any of my grandparents apart from one grandad who died when I was seven. But I do know my late dad’s mother had a black cat as I have a photo of her with him or her and my late mam’s parents always had cats. I’ve done years of research on our family tree, I feel as if I know my ancestors now, do we connect to their pets also by doing that? I think you love genealogy too don’t you? We have a spirit cat here in our home, I sometimes see him out of the corner of my eye, just a fleeting black shape and he jumps on my bed very lightly if Jozef isn’t with me. Shortly after we moved here and were sorting out the gardens I found the skull of a cat, did he live here in the past? Is this the spirit cat? The whole subject fascinates me. If I believed in reincarnation, I would believe you where a proud and beautiful domestic cat in a past life. Good thing being half feral. We need more feral cat-people. I have a photo on several of my Facebook pages that show orbs. Right in the area Dreyfuss used to nap. Midnight and Brinkley are in the photo. Its very eerie. The Dreams of A Cat Lover. If you leave a long comment, I’ll convert it to a post! I can hear you saying, no thank you. This comment is being converted to a post 😉 (Michael (Admin)).